Handcrafted Nic Salts by California Grown E Liquids. * Available in 30mg/ 50mg. Fresh Pressed Salts There are 5 products. Honeycomb Berry by Fresh Pressed Salts A unique blend that's sweet, juicy and utterly irresistible. Limeade and freshly picked Hawaiian berries finished off with a drizzle of honey to create the perfect balance of refreshing sweetness. Use with low-wattage vaping pod systems. Pink Melon Berry by Fresh Pressed Salts Enjoy a fresh mix of peach, watermelon and honeydew. A nic salts blend that will take your taste buds on a holiday to an island that will never be deserted. Use with low-wattage vaping pod systems. Lava Luau by Fresh Pressed Salts Cool off from those hot summer days with Lava Luau. A Hawaiian blend of watermelon, kiwi, and mixed berries frozen to a teeth chattering frost. Use with low-wattage vaping pod systems. Sugar Tantrum by Fresh Pressed Salts Whipped custard, vanilla beans and crunchy pecans blended in to a sugary masterpiece. The real tantrum's when the bottle is empty. Use with low-wattage vaping pod systems. 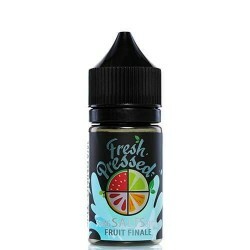 Fruit Finale by Fresh Pressed Salts A blend of juicy apples, ripe pears and amazon forest fruits come together to put an end to your search for the perfect vape. Use with low-wattage vaping pod systems.